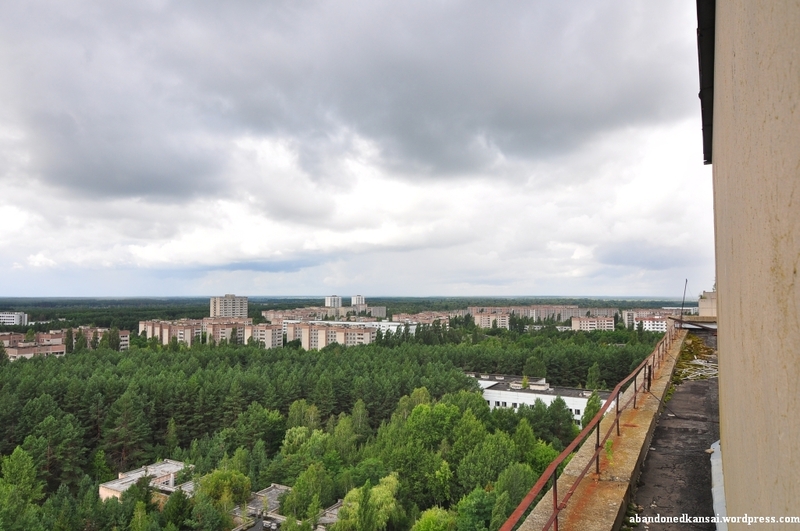 « Chernobyl: Fukushima In 25 Years? 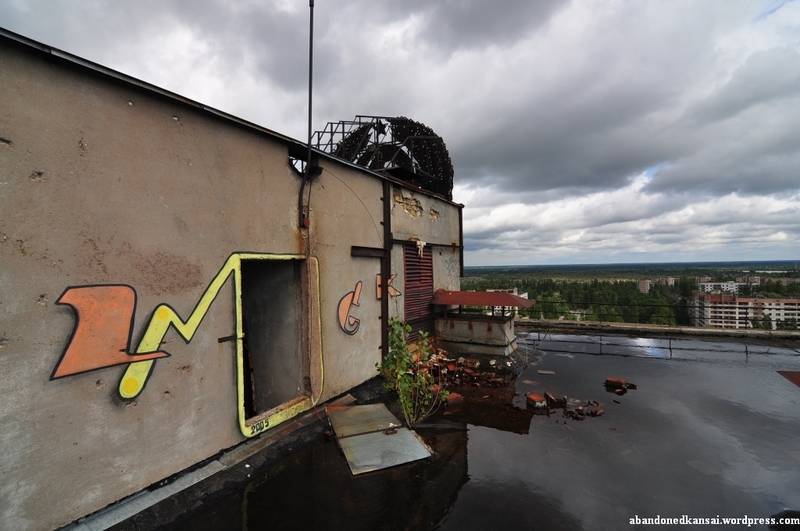 After sunny visits to the Jupiter Factory and the Kindergarten “Golden Key” we had some time left before we had to leave the Zone Of Alienation, so Maxim suggested to go to another rooftop. Of course he had to guard the car again, so Sebi, Michi and I went up on our own. 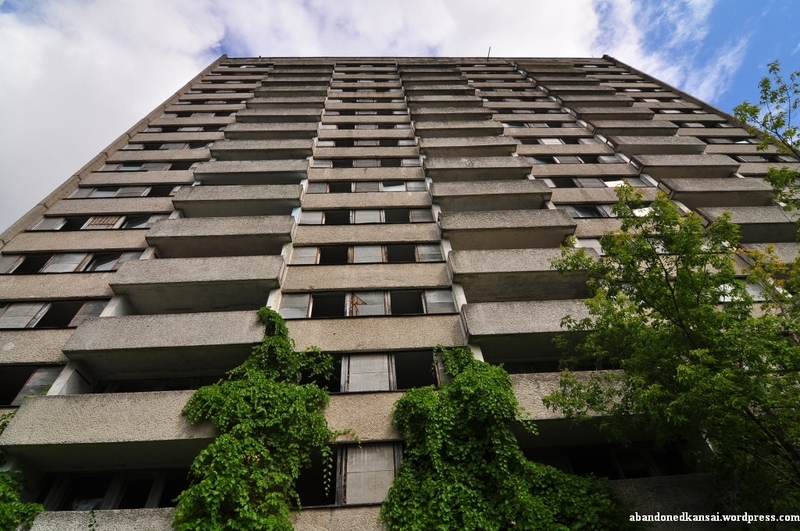 The construction of this building in the city center close to Lenin Square was interesting in that regard that for the first couple of floors the staircase was inside the building, but for the top half we had to go outside on a balcony and then get in again to climb more stairs. Quite weird… and nasty when it was raining, as we experienced on the way down. Furthermore I’m sure sooner or later one of those balconies will crumble (hopefully at a moment when nobody is standing on it) and then the floors above won’t be accessible anymore. Considering the state of the building in hindsight I’m actually not sure if I would go up there again – especially since the roof had huge puddles of water, which I’m sure contribute to the demise of the whole construction. The view was stunning though, no matter in which direction we looked. 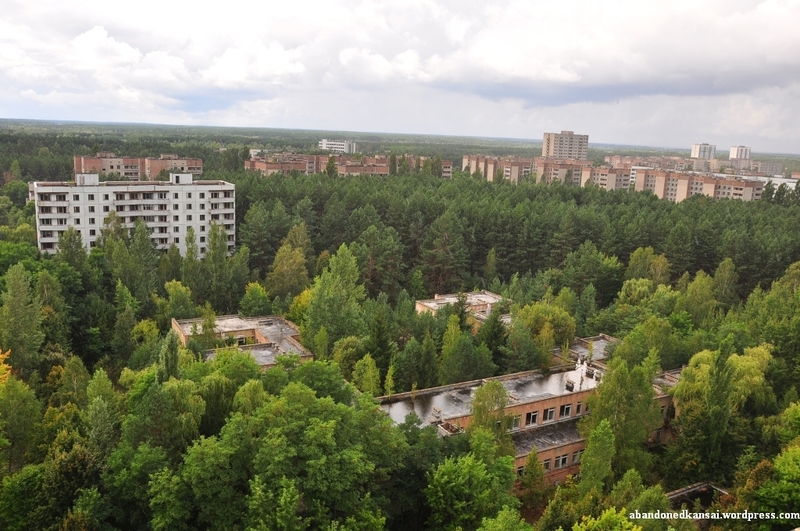 Seeing how the kindergarten was indeed swallowed by nature was as impressive as seeing the Amusement Park, the Palace Of Culture “Energetik” and Lenin Square at the same time. On the way down I took a quick minute to have another look at some apartments and actually found one with some interior left – in bad shape, but nevertheless interesting. 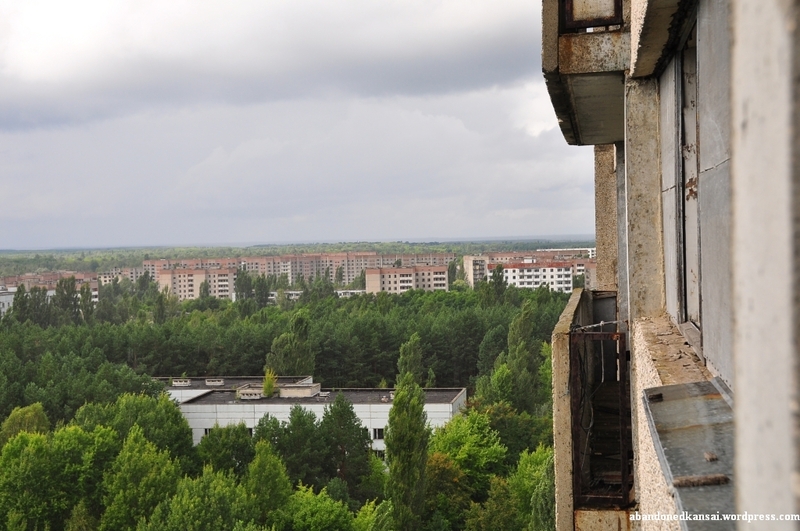 When I left the apartment house at Lazarev Street 1/14 I saw a graffito on a wall at the building next to it – the black show of a girl… and the last photo I took in Pripyat. Although now as I am writing these lines most nuclear experts agree that what happened in Chernobyl and what’s going on in Fukushima these minutes have barely anything in common, it’s still a weird feeling being only 550 km away from the events that shake the world these days. 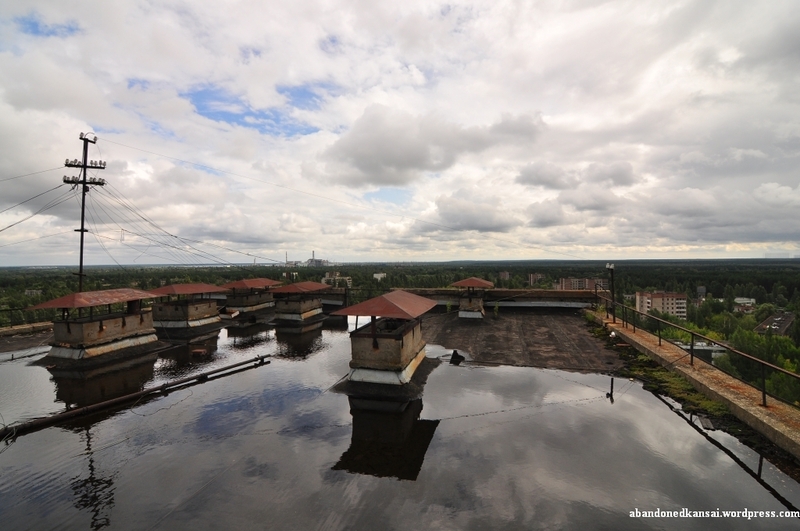 And I’m actually kind of glad that this is the last entry of my “Chernobyl & Priypat” special. 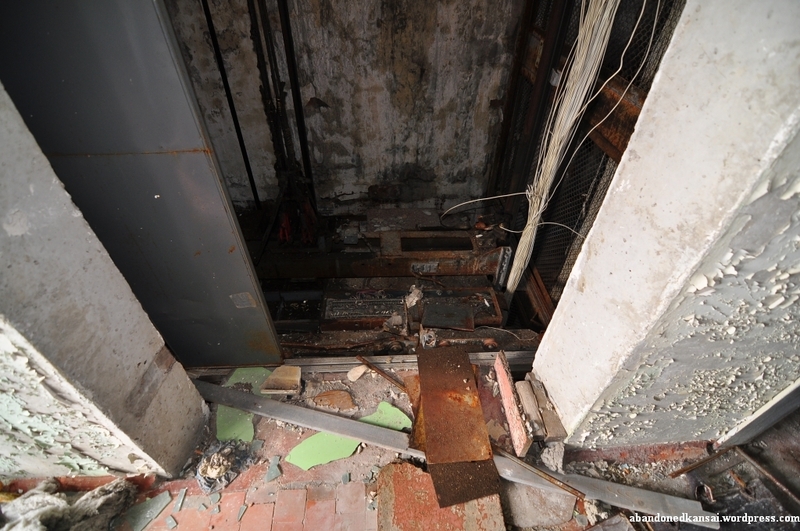 I seriously hope Fukushima will turn to the better and that you, dear reader, will continue to follow this blog when I’m going back to my main topic: abandoned places in Kansai and the rest of Japan. thank you for everything from Zone of Alienation. 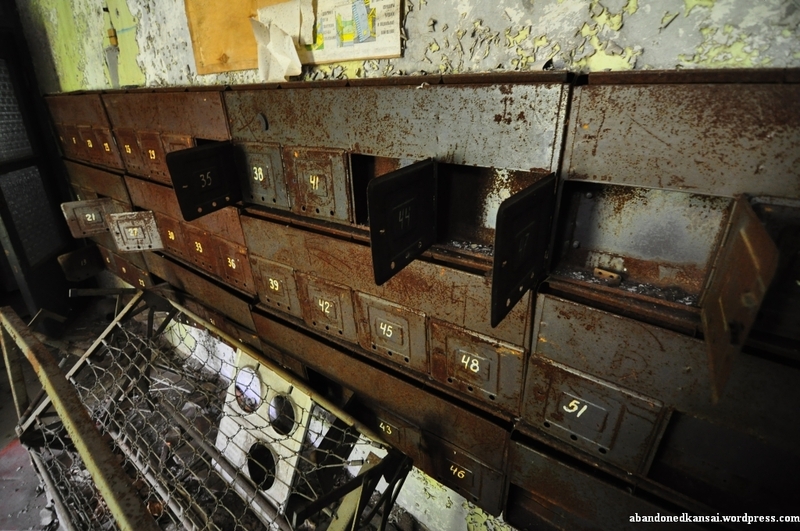 Your blog, as I can see, is focused on abandoned places in Japan. 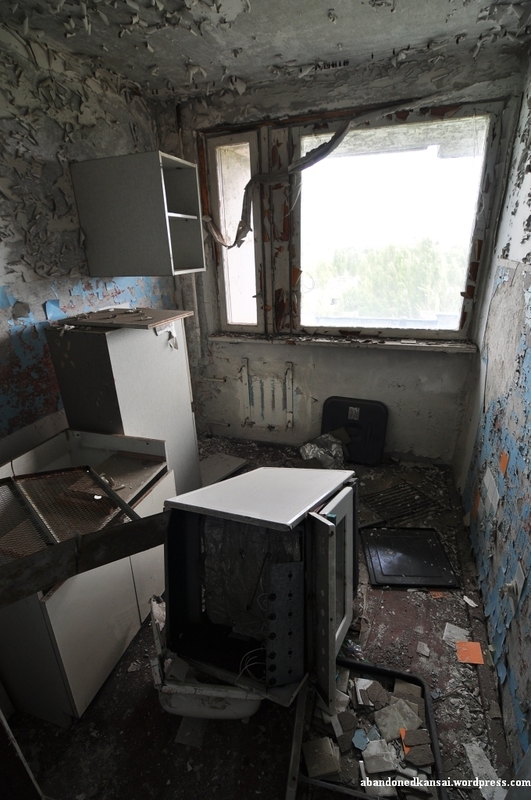 I looked through some, including that Japanese island, but… Chernobyl and Pripyat is paradoxically your greatest goal. This is definitely a painting on the wall. What happened in Chernobyl wasn’t a nuclear explosion, more like a fire in a nuclear power plant. When explosions happened during the fire, radioactivity was spread via burned particles and exposed nuclear material – but AFAIK it wasn’t a nuclear explosion as in Hiroshima and Nagasaki. Thank you so much for sharing your experience. 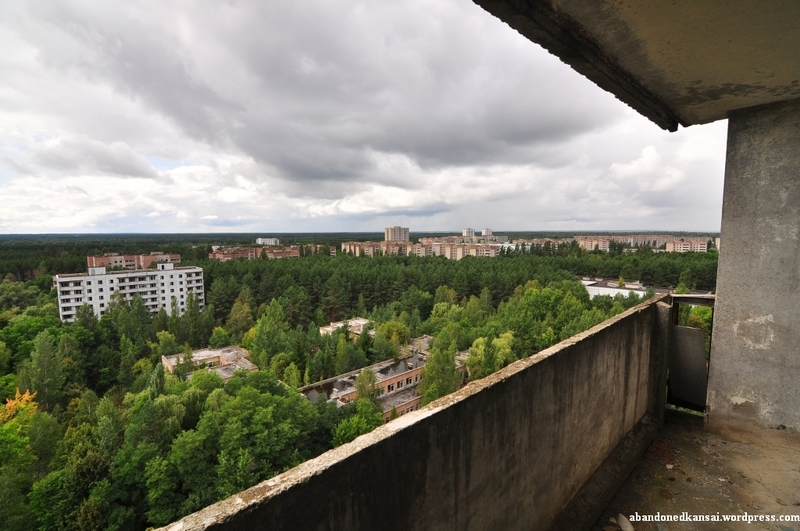 I’ve wanted to visit Pripyat for years. My grandfather and I always talked about it. His work involved nuclear energy and it was a constant subject for us. He passed last year, and with the upheaval in the Ukraine I don’t know if I’ll ever be able to finish what we planned. But your account is so incredible that I almost forgot to look at your pictures. 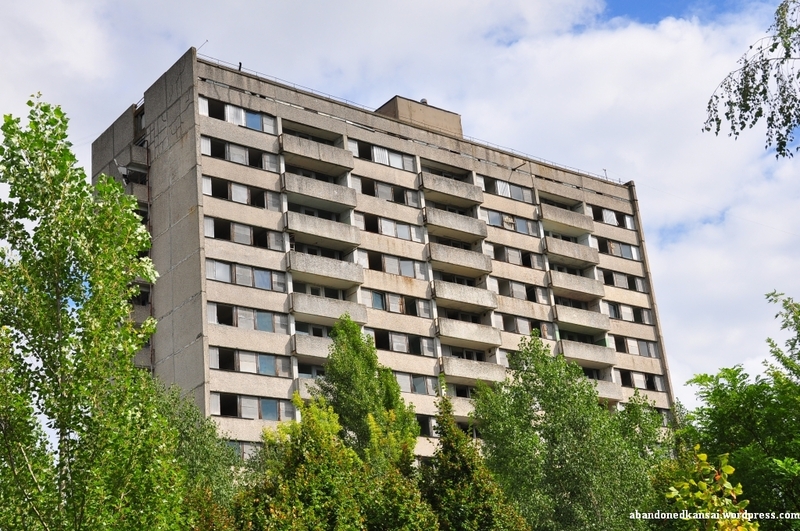 I am very sorry for your loss, but I hope that it doesn’t keep you from visiting Chernobyl with a friend or another family member as soon as the situation in the Ukraine clears up. With your background and mindset I am sure you will tremendously enjoy a trip there – not as in “a fun vacation”, but in a much deeper, sometimes shocking way. 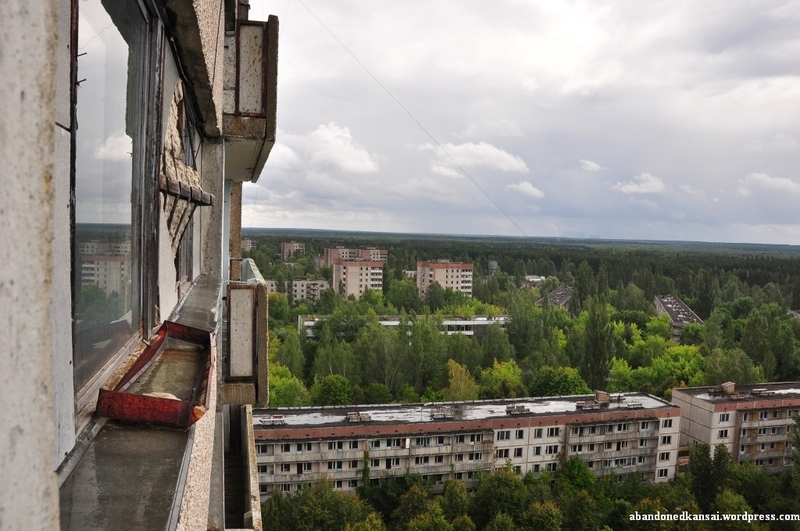 It’s been four years since I’ve been to Pripyat and the experience is still with me. So thank you very much for your kind words; they show me that I was able to successfully bring my thoughts to paper, at least some of them. 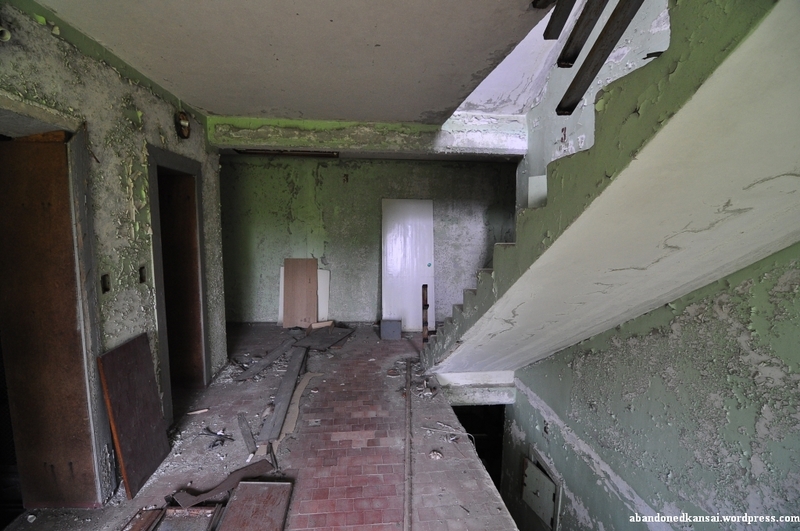 I was born in Western Ukraine and have always been intrigued by the “how” and “why” of Chernobyl. I’ve recently finished “Voices from Chernobyl: The Oral History of a Nuclear Disaster” by Svetlana Alexievich (a riveting and insightful collection of histories from locals who lived through the disaster; a highly recommended read). 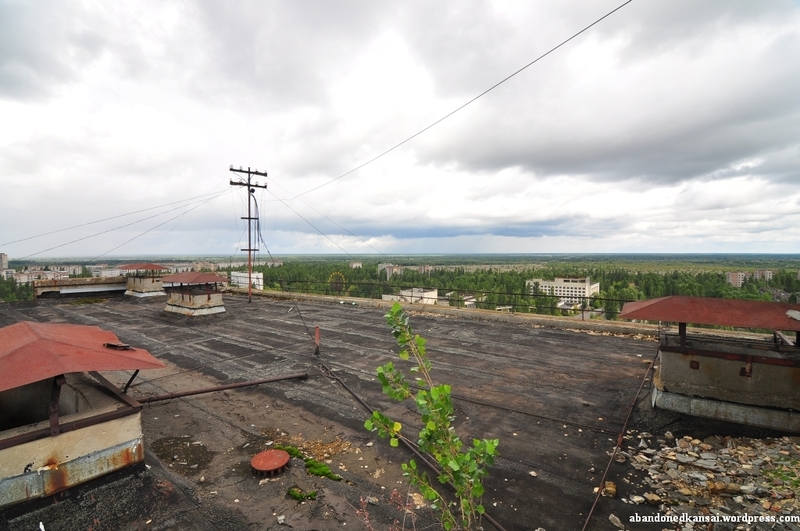 I stumbled upon one of your photos on Google maps (Pripyat) which led me to your blog. Thank you so much for sharing your experience, truly! Part of me wants to visit the zone yet I’m not sure I can muster up the courage to go. There’s just so much sadness and pain. 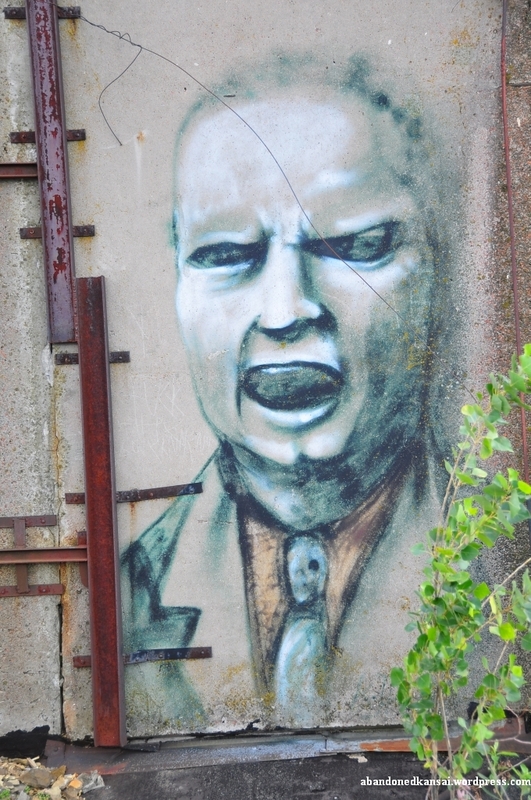 I visited the Chernobyl Museum in Kyiv a few years back and that was a very somber experience in and of itself. Thank you very much for your kind words, Mariana! 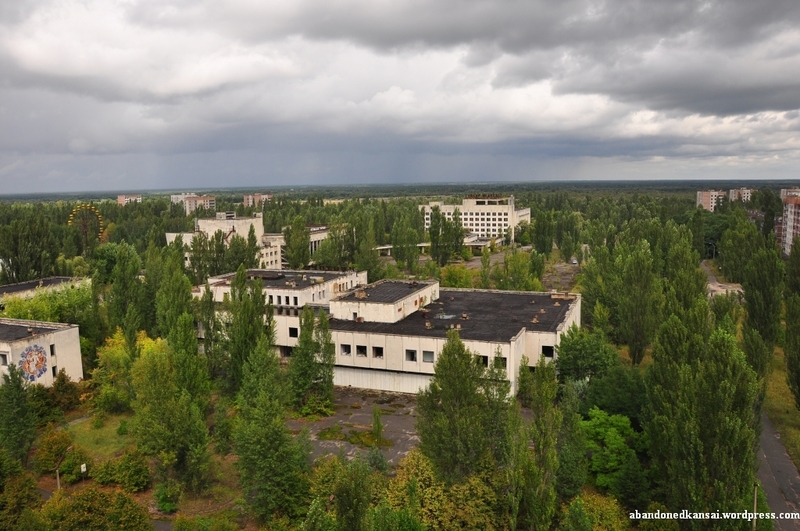 To me the trip to Chernobyl and Pripyat was the most memorable in my whole life – shorter, but more intense than even the two weeks I spent in North Korea. If you have the time and opportunity to go there, I strongly recommend it. But don’t do the day trip with all the Call of Duty kiddies and “eastalgia” tourists. Go there for at least two days and have a look at the parts that you are really interested in, the parts the day trippers don’t have time for. Take the opportunity to stray away from the guide and take it all in. Listen to the trees and the wind and the animals. 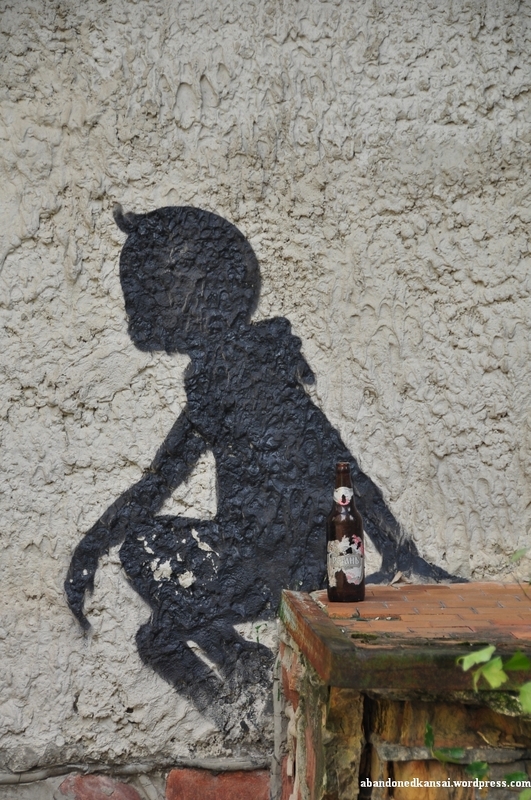 It’s been almost five years that I went there… and I still think about it almost every day; not in a hurtful way, it’s not haunting me – but it reminds me of the important things in life, and that they could be gone from one second to the next.